Wheatfields Cypress tapestry shows the work of Van Gogh. 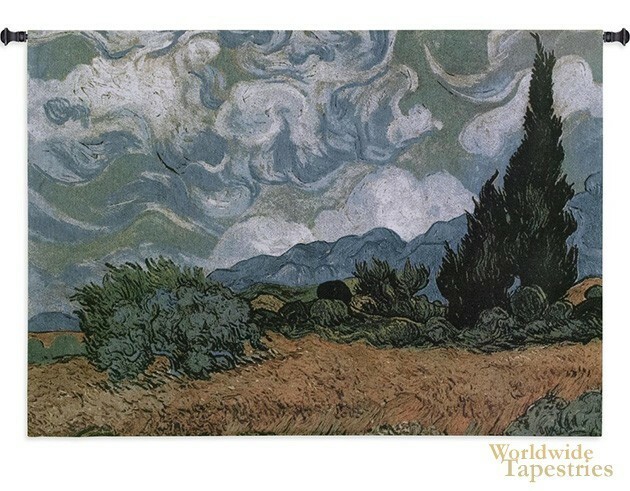 This work shows a wheatfield with Cypresses, and is based on Van Gogh's work from 1889. In this gorgeous work, we see his work from Saint-Remy near Arles in France, and he created this work, while writing to his brother Theo " I have a canvas of cypresses with some ears of wheat, some poppies, a blue sky like a piece of Scotch plaid; the former painted with a thick impasto..." The swirling designs on the clouds evokes a wildness in the skies, and the rendition of the wheat field itself is beautiful . The Cypress tree is depicted in a fluffy and lively manner. In fact, the entire work has an uncanny sense of movement due to the ingenious use of lines and contrast. Wheatfields Cypress tapestry is backed with lining and tunnel for easy hanging. Note: tapestry rod and tassels, where pictured, are not included in the price.